Power MAP sensors, airflow meters and LED meters from this 5V car supply. Most cars with engine management feed a 5-volt regulated supply to sensors. For example, airflow meters of the last decade almost universally use a 5-volt supply, as do MAP sensors. In addition, accessory LED and LCD panel meters (like the one covered at DIY Digital Battery Monitor) are run from a 5V supply. So what happens if you want to use a MAP sensor in a car that didn’t originally come with one, or swap a 12V supply airflow meter for a 5V design, or use an LCD or LED panel meter in your car? The traditional answer has been to use a 5V regulator and a handful or other components to build a 5V supply. In fact, that’s what we did in the Battery Monitor article. 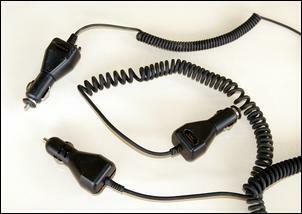 And the major benefit of modifying a car phone charger is that it’s cheap, easy and effective! The idea for this modification was authored by Timo Mahoney and published in Silicon Chip magazine – see Circuit Notebook. As shown in this circuit diagram (taken from that issue of Silicon Chip), the guts of the voltage converter is a single 8-pin integrated circuit (IC). The IC controls the output voltage, using voltage feedback provided by the resistors shown on this diagram as R1 and R2. If you change the values of R1 and R2, the voltage output will also change. Rather than calculate the required value of the resistors to gain an output of 5V (or whatever voltage you want – you can get quite a range), we’ve taken the much easier route of installing an adjustable pot in place of the two resistors. Then it’s just a case of measuring the output voltage and turning the pot until the right output is obtained. 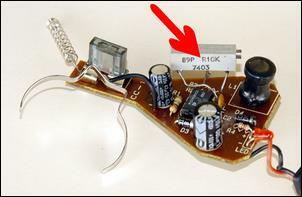 Yes, it’s as simple as replacing the two resistors with a pot! The first step is to find a mobile phone power adaptor. You can buy new from discount stores for as little as $AUD5 or get them for nearly nothing at garage sales, the tip, etc. Inside you’ll find a circuit board with the components on it which are shown in the above diagram (plus often a LED and its associated resistor). However – and this is a very important point – the markings on the board (R3, R2, etc) are probably not the same as in the above diagram. Hmmm. So how do you find the components that need to be changed? Have a close look at the top and bottom of the board. Somewhere there will be two resistors that join to a common track at one end, but go to different tracks at their other ends. The track that both resistors join to will also connect to pin #5 of the IC. (Pin 5 is at one end of the IC.) Given that there will only be three (or at the most four) resistors on the board, it isn’t all that hard to find the pair in question. 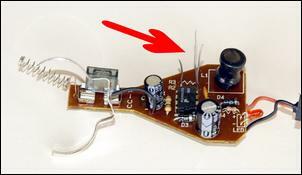 In this particular design the pair of resistors is shown here by the arrow. They joined one another (and Pin 5 of the IC) at their left-hand ends and went their separate ways at the right-hand ends. The next step is to un-solder and remove the pair of resistors. To replace the resistors you’ll need a multi-turn trim-pot. We used 10-kilo-ohms but anything around this value should be fine. This pot was salvaged from an old piece of discarded consumer electronics, but even buying new will cost you only $AUD1.50 (eg Jaycar Electronics cat no RT-4614). To make soldering the new pot into place really easy, first solder three short lengths of wire to the board. Where the two resistors originally joined one another, you need solder into place only one piece of wire. Be careful not to create any solder bridges to other tracks. The pot can then be soldered to the short lengths of wire. The centre terminal of the pot goes to the track where originally the two resistors joined one another, while the other pot terminals connect to where the other ends of the resistors went. 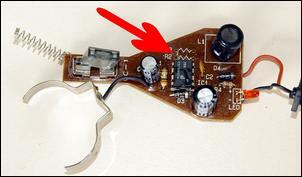 Measure the voltage on the output and use a small screwdriver to turn the pot. As you turn the pot, the output voltage will change. Set it to 5.000 volts (or whatever voltage you want) and then turn on the headlights. Despite the battery voltage falling, the output voltage shouldn’t change more than the tiniest amount. Start the car and the output voltage with the car running should again remain the same. 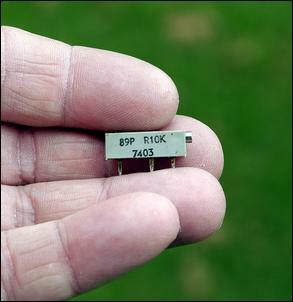 Here the input and output voltages can be seen – 13.86V input and 5.006V output. On the one we built, the no-load output voltage varied only from 4.999 to 5.010 volts with an input voltage range of 8-14V. However, when a load was placed on it the voltage did sag – so you should set the voltage with the load attached. You can draw about half an amp (500mA) from the adaptor. Any more and the voltage droop becomes severe and the IC starts to warm up. However, in most applications, 0.5 amps is plenty.